What we don’t know can hurt us—and does so every day. Climate change, health care policy, weapons of mass destruction, an aging infrastructure, stem cell research, endangered species, space exploration—all affect our lives as citizens and human beings in practical and profound ways. But unless we understand the science behind these issues, we cannot make reasonable decisions—and worse, we are susceptible to propaganda cloaked in scientific rhetoric. 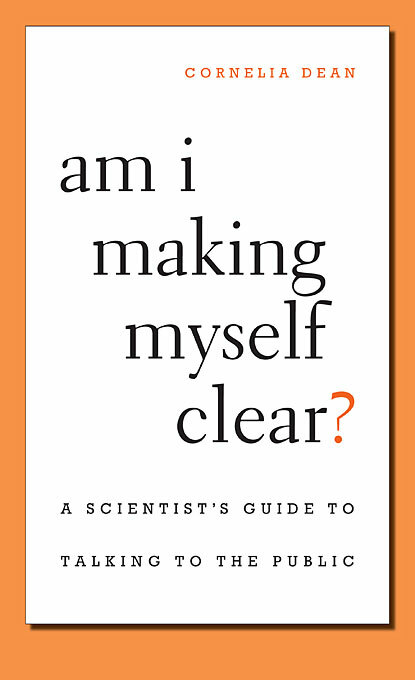 To convey the facts, this book suggests, scientists must take a more active role in making their work accessible to the media, and thus to the public. In Am I Making Myself Clear? Cornelia Dean, a distinguished science editor and reporter, urges scientists to overcome their institutional reticence and let their voices be heard beyond the forum of scholarly publication. By offering useful hints for improving their interactions with policymakers, the public, and her fellow journalists, Dean aims to change the attitude of scientists who scorn the mass media as an arena where important work is too often misrepresented or hyped. Even more important, she seeks to convince them of the value and urgency of communicating to the public.